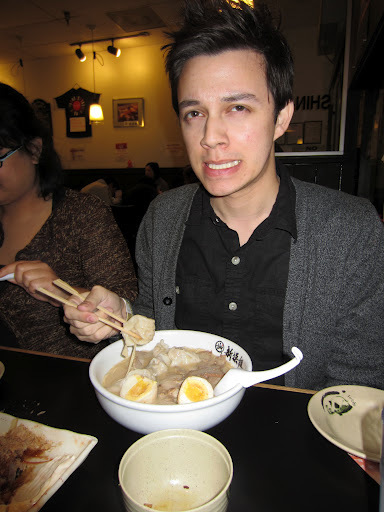 Three weeks ago I went on another ramen run with Matt and the Filipinas. 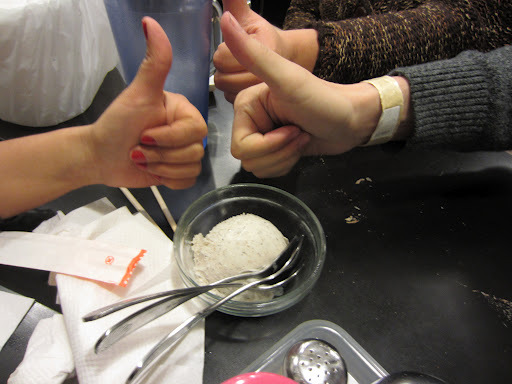 We went to the Shin Sen Gumi in Rosemead. 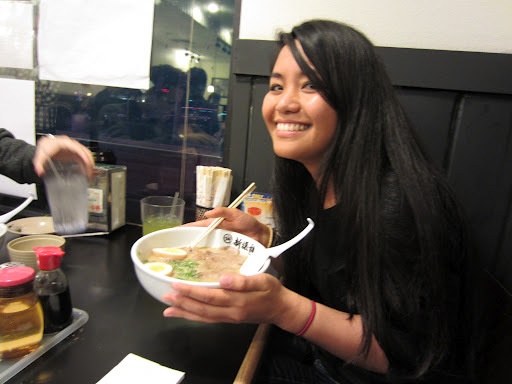 I’ve been there several years before and it was where I took Tanya to have her first ramen experience. 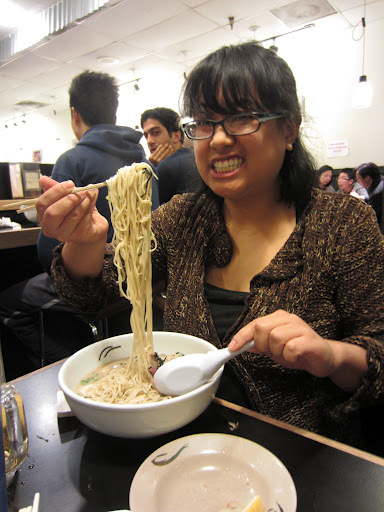 This place didn’t impress me at the time because my first ramen was at the Shin Sen Gumi in Fountain Valley and have been in love with that place ever since. There was definitely a difference in the broth flavor. When we arrived, parking was horrible! It must have taken us 15 minutes of circling two lots to find parking. Luckily, we found a spot close to the shop. There were tons of people inside and outside of the ramen shop. The wait took another 25 minutes or so, which was not so bad considering there was four of us. It was pretty happenin’ on a Sunday night! We also randomly ran into a friend from church, whom we would not expect to see all the way out in Rosemead. 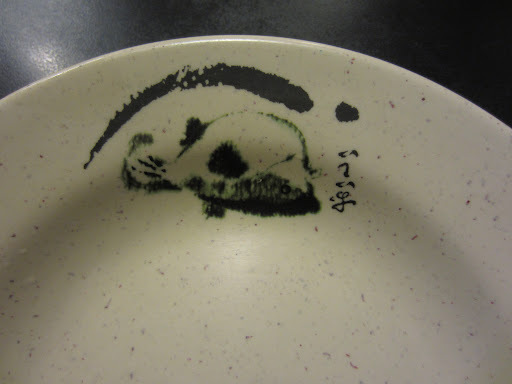 A panda? A mouse? 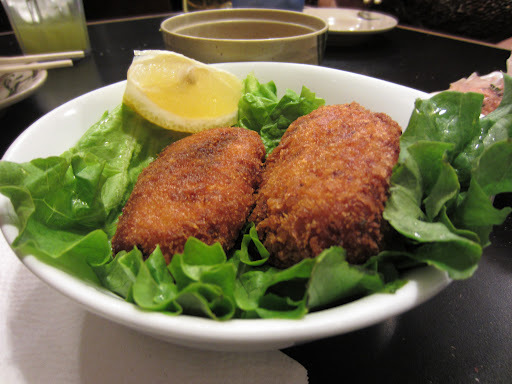 After rotating the plate several times, it turned out to be a fish. Behold, our random selection of appetizers! 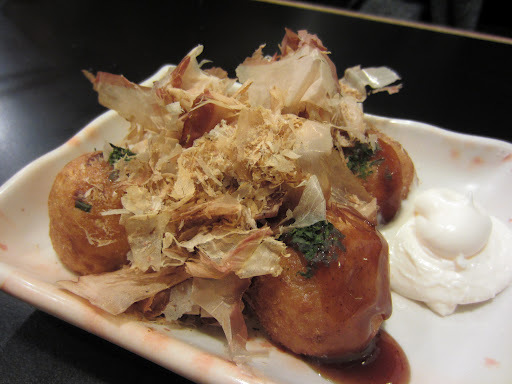 Although the place was packed, we got our appetizers and ramen at a descent amount of time. 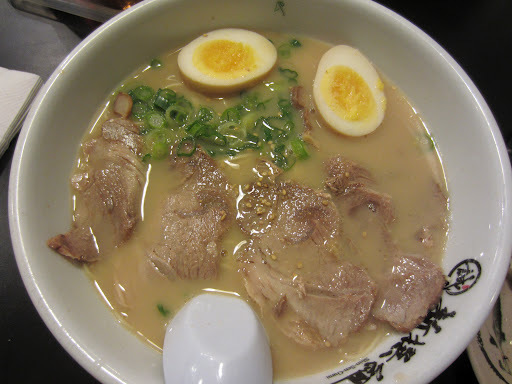 I noticed that the chef at this Rosemead ramen house was the same one I used to see in Fountain Valley. Seeing him behind the kitchen made me so eager to eat my ramen! After all these years, you’d think I would know his name. Shame on me. I have come to the conclusion that this chef must have been the reason why Fountain Valley was so good! Because Rosemead suddenly tasted AMAZING! The broth, wow. 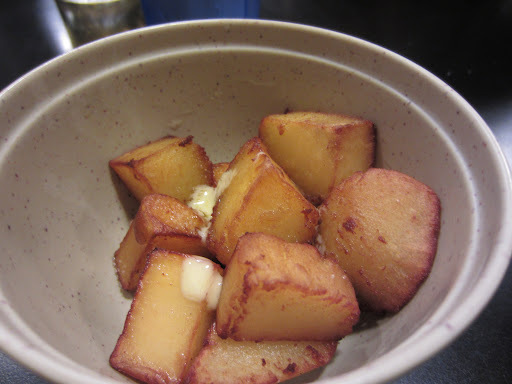 I don’t feel the need to go into full detail because everything was cooked to perfection. According to my taste buds… But everyone else at the table seemed to agree, as we all shared a moment of silence in ramen bliss. 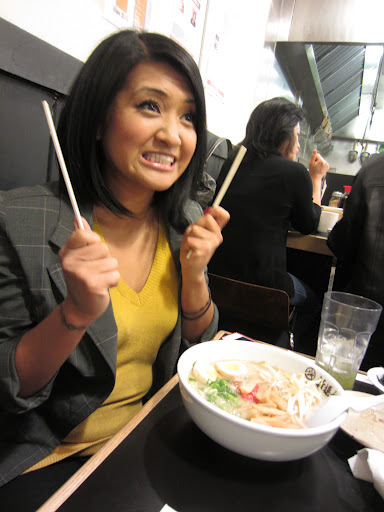 Was I the only one that felt giddy over having ramen?! I scarfed down my entire bowl of ramen. It was that good. Then we all shared a small bowl of ice cream. 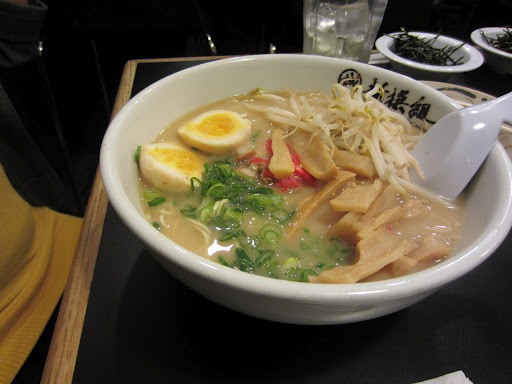 After having ramen in Rosemead, it really taught me that every place deserves a second chance. Sometimes a third. I’m glad we discovered how good this ramen house turned out to be. Not only was it awesome, but it is a lot closer to home than Fountain Valley! And I could totally come here after work since it is on the way. Yay for me! If you’re wondering what this whole deal is with “Matt and the Filipinas,” it’s actually an unofficial band name. 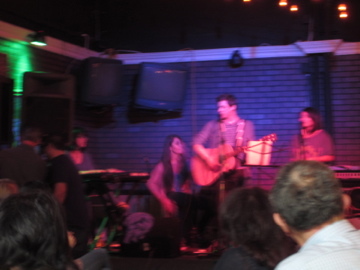 Matt, who is not Filipino, just so happens to have a team of Filipinas as his band. 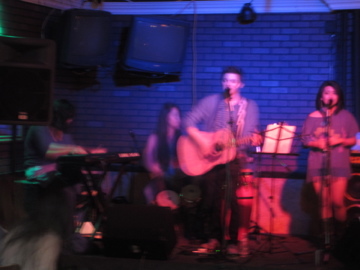 Check out these blurry photos from our last show! Serenading at a venue near you! If you’d like to hear Matt, check out his Facebook page! Candice has one too! Click here. Thanks for reading! Tanya and I actually went to Fountain Valley a week later and we’ll be writing about that soon. See ya next time!